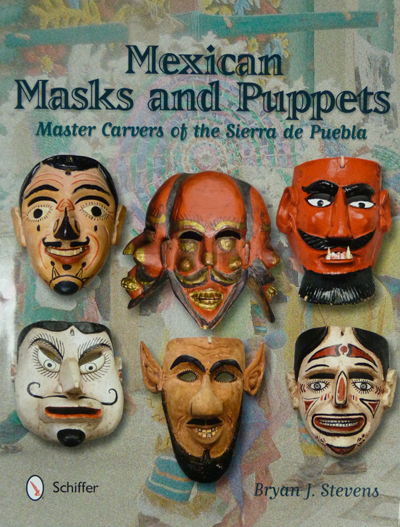 Today I will continue to present Moro masks from the State of Mexico. We will look at four different examples, all variations on a traditional generic design. The first of these has an articulated jaw, while the other three lack this feature. I purchased the first mask from René Bustamante in 1994. Its town was not identified, but it was from the State of Mexico. 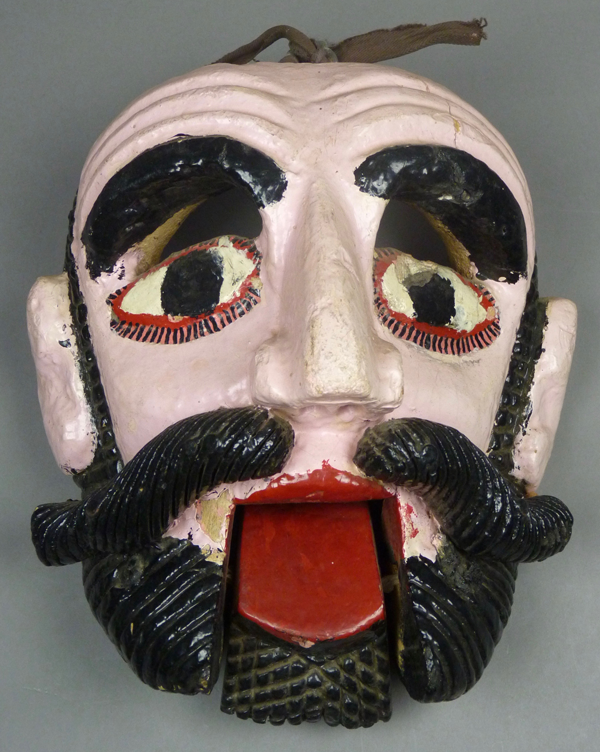 A very similar Moro mask from the collection of the International Folklore Museum in Santa Fe, New Mexico, is illustrated in Barbara Mauldin’s valuable book—Tigers, Devils, and the Dance of Life: Masks of Mexico (p. 70). 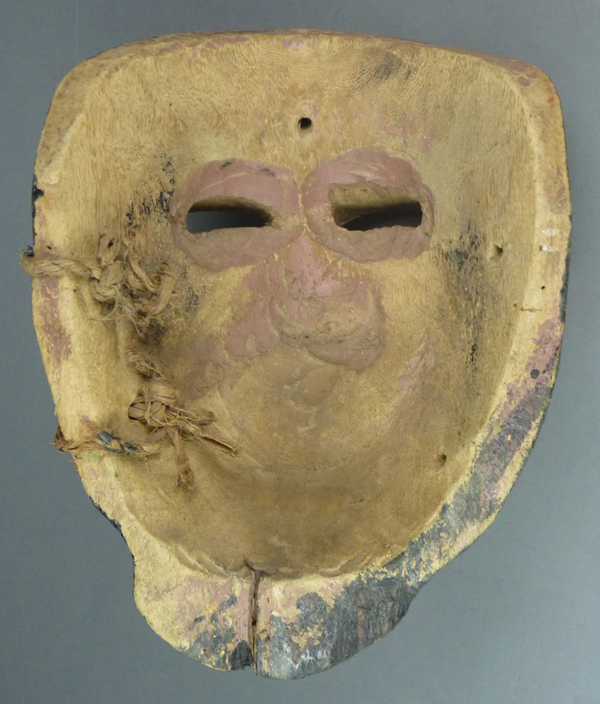 That old mask, which had been obtained from the Cordry collection, was said to date to the early 20th century, from an undocumented town in the State of Mexico. I would think that this one is from the middle of the 20th century. I particularly like the cross-hatching of the beard below the articulated jaw. This Moor sticks out his tongue. Moros can function as clowns. The two sides of the mustache are nailed onto the face. 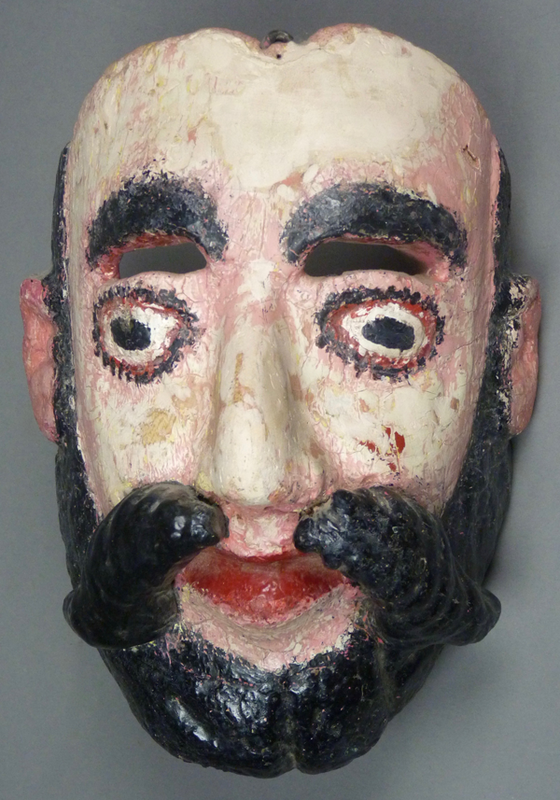 This mask is 10½ inches tall, 8½ inches wide, and 4½ inches deep. The second mask, labeled as coming from Toltepec de las Parotas, State of Mexico, was purchased from Robin and Barbara Cleaver in 1994. Apparently the town of origin is actually Totoltepec, but I found no Moro videos there, with either spelling. 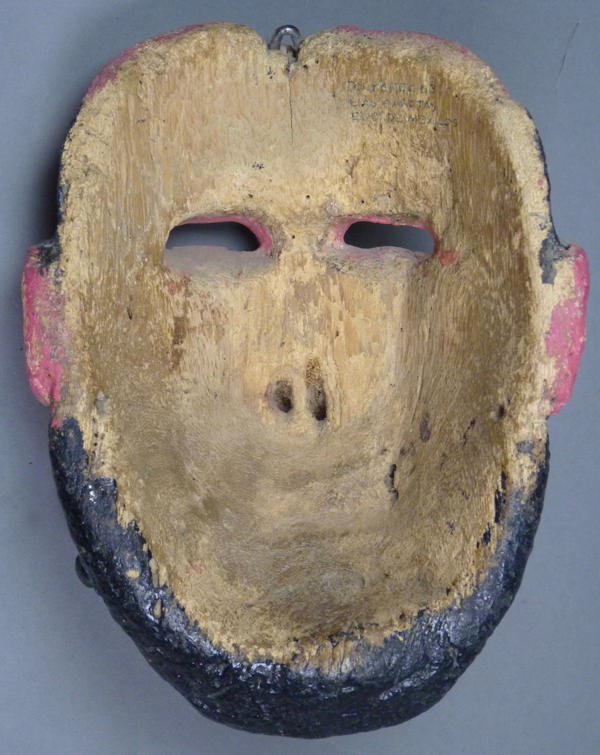 There is a very similar mask from the collection of the International Folklore Museum in Mauldin (p. 71 top) from El Anate (or Amate/ fig tree?). 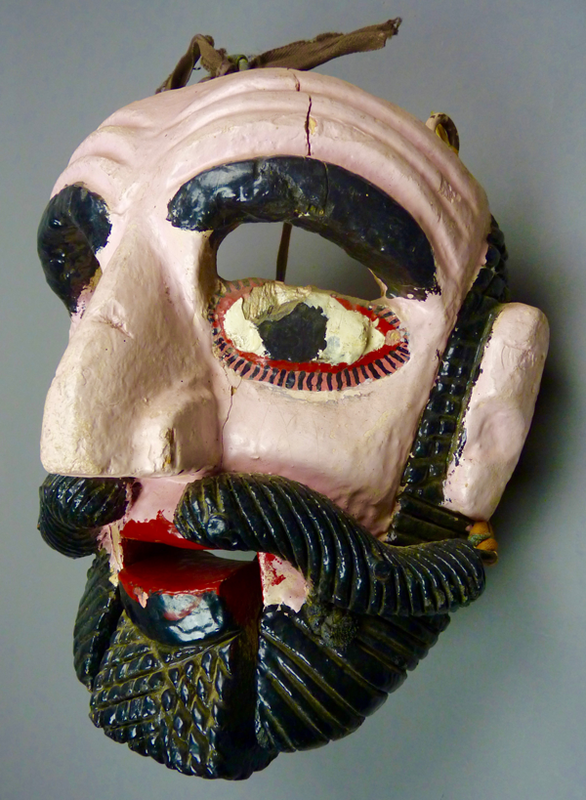 This mask is obviously quite old, with many layers of worn paint. It is probably very finely carved, although this is difficult to see under this flaking surface. 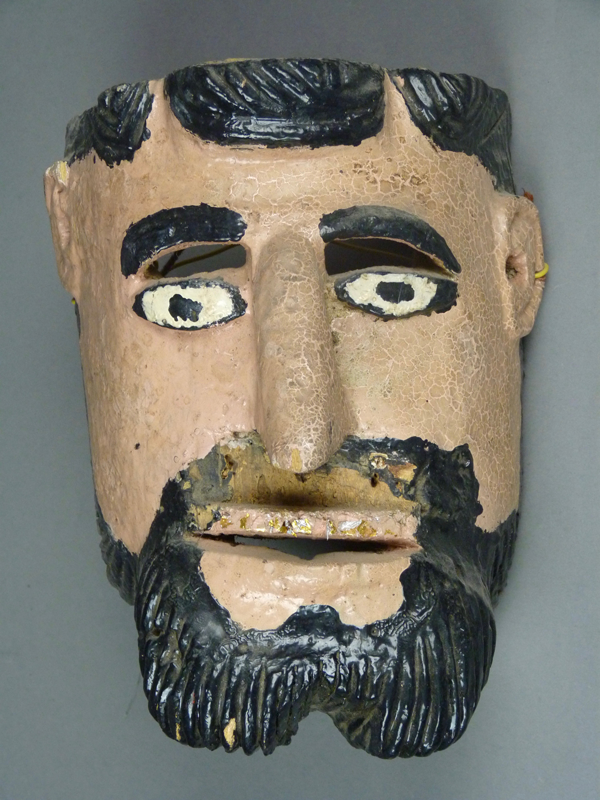 This mask is 10 inches tall, 7 inches wide, and 3¾ inches deep. The back reinforces my impression that this is a rather old mask, circa 1940s. The next Moro is interesting because it is large and well carved, but the face has never been painted and the black paint has been crudely applied. I obtained this mask from Jaled Muyaes and Estela Ogazón, in 1998, with the limited provenance that it was a Moro from the State of Mexico. I admired this mask immediately, because it achieves such a powerful presence in spite of the simplicity of its design. 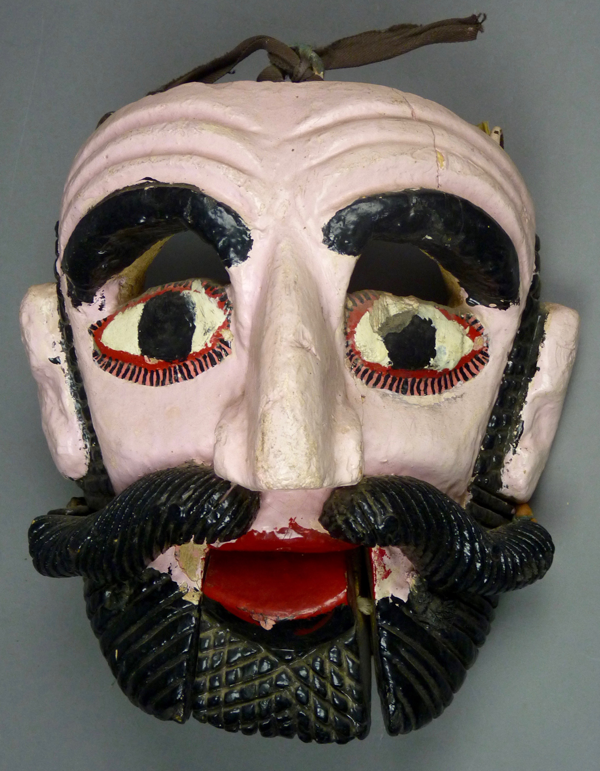 This mask is 9½ inches tall, 7½ inches wide, and 5 inches deep. 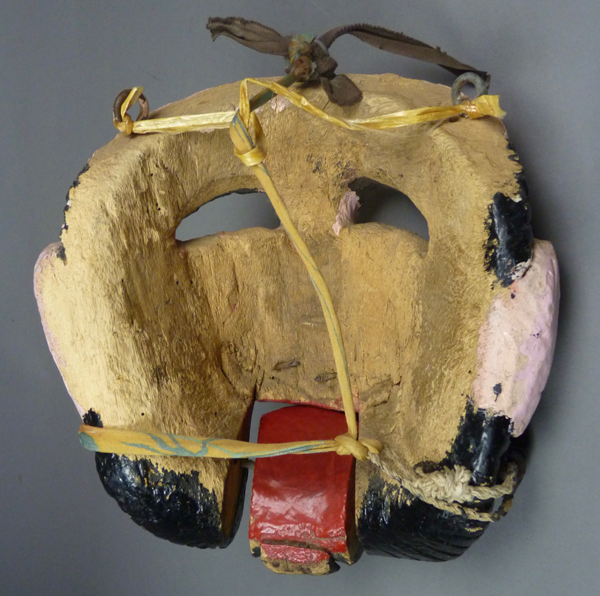 This is another mask with an old back and tattered remnants of what was probably the original strap. The last mask in this quartet of Moors is Sabario, a named character found in the Moros and Santiagueros dances. 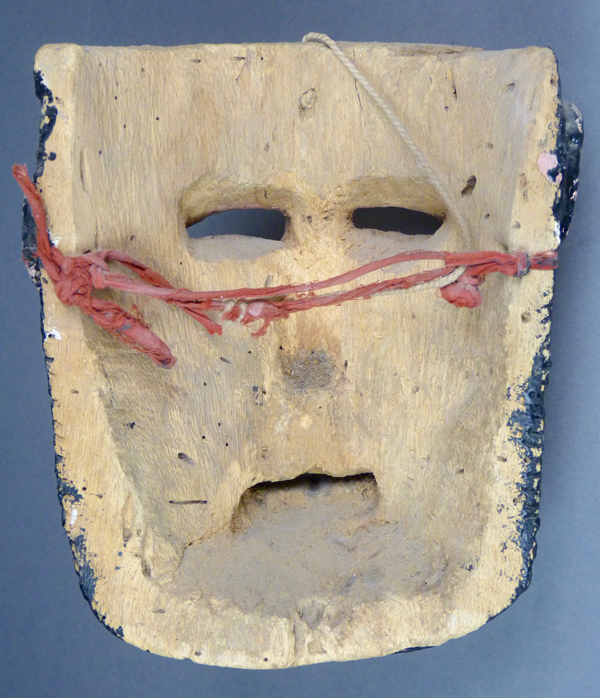 I bought this mask from René Bustamante in 1994. It was found in Santa Cecelia,State of Mexico. The mask is missing what was probably an applied wooden mustache. I am very fond of it anyway. 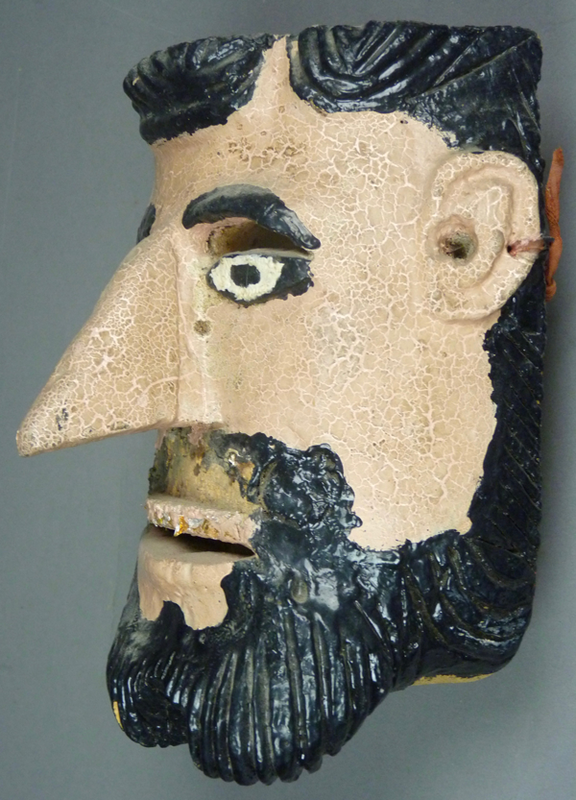 There is so much to like about this mask—the sharp nose, the carefully carved hair and beard, and the delicate ears. 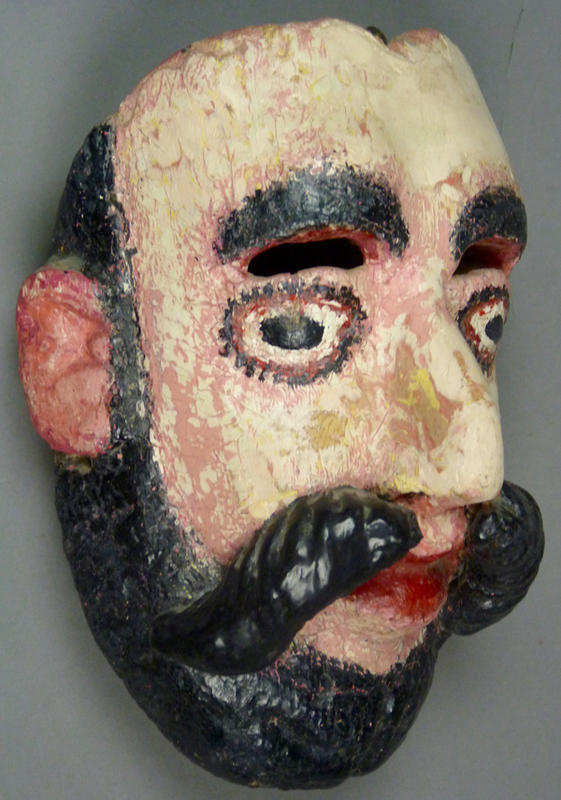 Obviously the nose was carved from a piece of wood that was glued onto the front of the original block, a common practice in Mexican mask making. 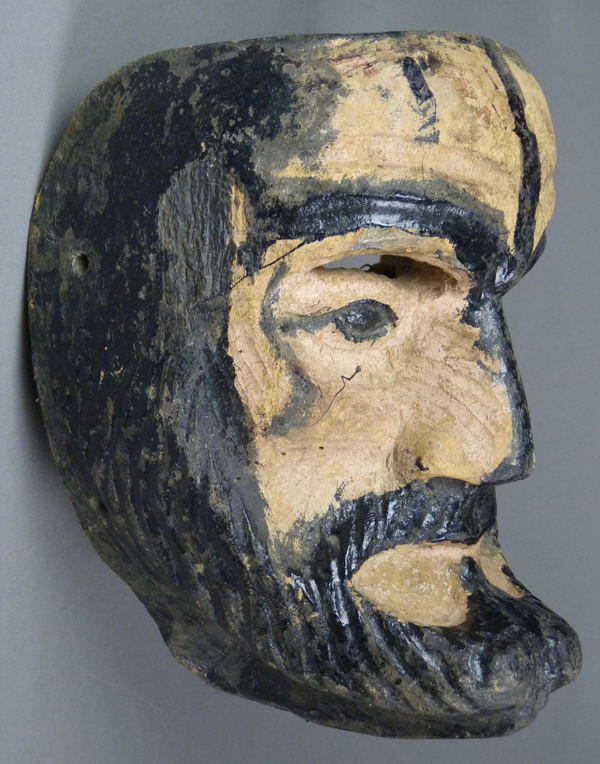 The alternative method for carving a long-nosed mask is to start with wood that has a protruding branch. 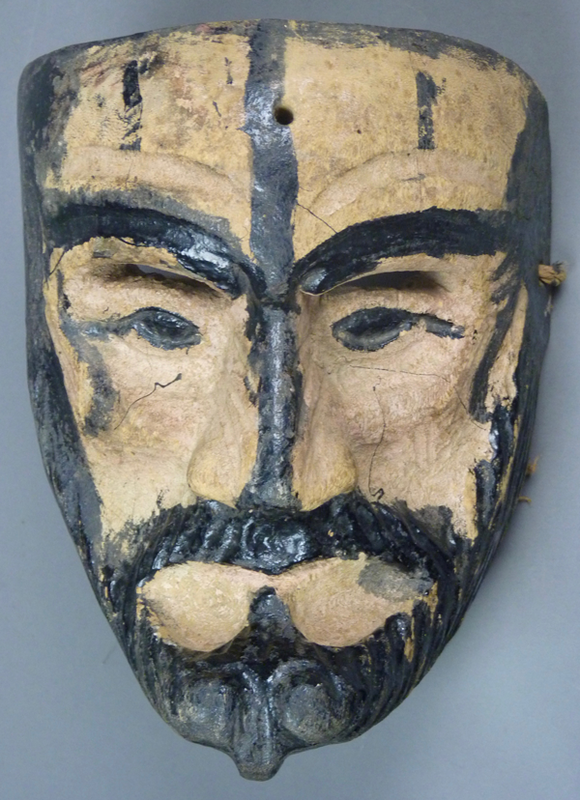 This mask is 8½ inches tall, 7 inches wide, and 5 inches deep. The back is moderately stained after obvious use. Next week I will conclude this series of Moor masks from the state of Mexico with a trio from Apatlaco.